When people think about the United States, and the Southwest in particular, they don’t really think about there being any castles. However, the southwestern region of the country has several “castles” that are not only interesting to see but also have their own unique and fascinating stories. From a stone castle built into a cliffside by hand to an elegant castle estate, there is a wide range of castles to be found in the state of Arizona as well as castles of interest to just about every visitor to the American Southwest. Camelback Castle, formerly known as Copenhaver Castle, was mainly built by hand by its previous owner, Dr. Mort Copenhaver. Copenhaver was a dentist who purchased an almost vertical piece of land on the side of Arizona’s Camelback Mountain. Desiring a castle-like home on the lot, he blasted rock in order to create space for the structure and then proceeded to construct the castle by moving and placing each stone by hand. The castle consists of eight levels of thick granite walls, five bedrooms, ten balconies, a large waterfall, four fireplaces, a dungeon that features a bar, secret passageways, and much more. Mollohan Castle, located just 10 minutes from the city center of Tucson, is surrounded by the beautiful Sonoran Desert. It makes for a great place to stay a few nights for a wide variety of travelers, including desert adventurers, castle enthusiasts, culture seekers, retreat seekers, sun lovers, and more. The patios and decks of the castle offer guests spectacular panoramic views of Tucson and the surrounding mountain ranges. Mollohan Castles features several bedrooms, outdoor futons, a family kitchen, a washing machine, a gas grill, and a pool table. There is also a trail starting behind the property for hiking, biking, and horse riding. 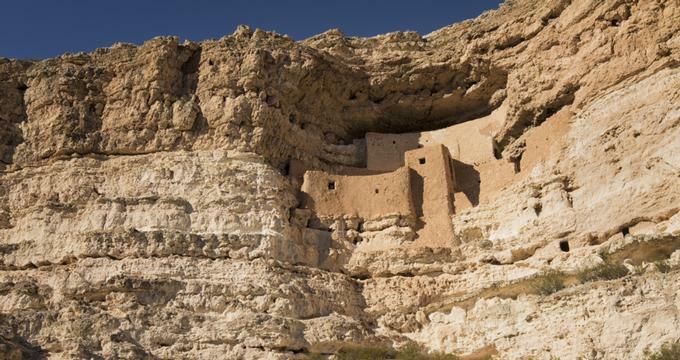 The Montezuma Castle National Monument offers visitors a chance to view one of North America’s best-preserved cliff dwellings, offering a look into the windows of the land’s past. This 20-room dwelling was built into a tall limestone cliff and shares a story of survival, ingenuity, and prosperity within the harsh landscape of the desert. 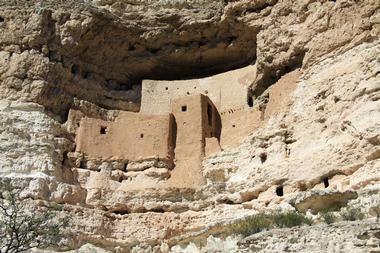 Montezuma Castle was made one of the first National Monuments of the United States in 1906 by President Theodore Roosevelt. The monument is a legacy of the area’s Sinagua people. Even after their departure 600 years ago, the Sinagua still inspire those who come to see the cliff dwellings. Mystery Castle is a stone castle built in the Arizona desert. Featuring 18 rooms, parapets, and 13 fireplaces among other features, the structure is furnished with antiques from the Southwest. The castle was built by Boyce Gully for his daughter, Mary Lou. The two used to build sandcastles on the beach in Seattle. Saddened when the tide washed away her castles, Mary Lou asked her dad to build a strong castle that she could live in someday, suggesting it be built in the desert, where there isn’t any water. 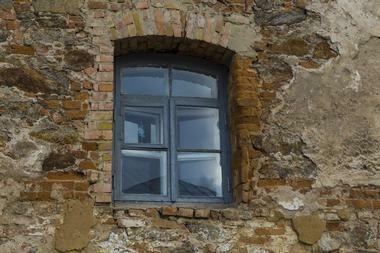 The castle is open to visitors from October to May. There are some places in the world that draw people to them and inspire visitors to one day return to discover more. Just east of Tucson in the Galiuro Mountains is just such a place, an area known as the Copper Creek District. The area is rich in both history and intrigue. One sight to see in Copper Creek is what’s left of Sibley Castle, also known as Sibley Mansion. It was once the home of Joseph Sibley, founder of Galena-Signal Oil. Sibley had acquired a large amount of wealth from the business and was known to be a friend of Rockefeller. The Ashley Castle in Chandler is a stately and beautiful English-style castle. Guests are welcome to take a walk through the impressive outdoor garden rooms of the grounds and enter an elegant kingdom once they step through the antique doors of the castle. The castle is decorated with stunning treasures from Europe as well as fine linens and rich textures. While the main feature of the grounds is the splendid castle building itself, the outdoor gardens are particularly beautiful, and the driveway includes a charming fountain. The Ashley Castle often hosts many special events, such as wedding, birthdays, and corporate events. Tovrea Castle at Carraro Heights is considered to be a desert gem. For 90 years, the castle has intrigued locals and visitors alike in the Valley of the Sun. Listed on the National Register of Historic Places, the castle is four stories tall and is 5,000 square feet of architectural wonder. The groomed cactus gardens and natural flora of the Sonoran Desert cascade from Tovrea Castle. The castle can only be explored on a tour, and it’s advised to buy tickets as soon as possible before a visit as they often sell out months in advance. There’s very little walk-up availability.